The trailer for Sorry to Bother You is super slick and humorous. I thought I was walking into this generation’s Wayans Brothers flick and was prepared to laugh until I cried. The film did not disappoint in its creativity and details, but this was not like any movie that I’ve seen before and certainly, wasn’t the comedy that I was expecting. I can’t really tell you that I got everything about it. I feel like this is a movie that you need to watch and then talk through. This is me, whining about seeing a movie before my friends and family, because I really feel like I need to process it more. I didn’t feel like this after Birdman, though it feels similarly artistic and surreal. But Birdman also didn’t feel as socially relevant to me. 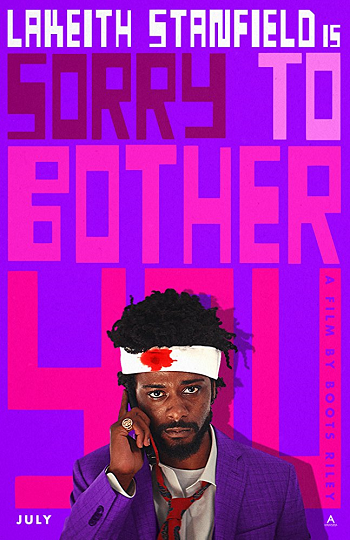 Sorry to Bother You tells the story of Cassius “Cash” Green (played by Lakeith Stanfield), a man troubled by his future and how to make his mark on the world. He dreams of success, while living in his uncle’s garage and driving his uncle’s beat up junker car. His girlfriend, Detroit (played by Tessa Thompson), lives in the moment and loves Cash in spite of his lack of success. In this dystopian Oakland, Cash gets a job as a telemarketer, working for commission only (an important plot point that leads to a telemarketer revolution of sorts as they fight for humane working conditions and a fair wage). Cash dreams of becoming a successful Power Caller with entrée to the coveted gold elevator and a success that he wants more than anything. Sorry to Bother You is all about its details. Detroit’s artistic optimism. Her parents wish to give her an “American” name. Her self-abusive performance art. Her homemade statement earrings. Cassius’ beginning realization that his accusations of her sucking up to her rich, white, buyers is no different than his work, which leads him to the power-caller realm. A blow to Cash’s head with a coke can sets off a media pop-culture frenzy that shows up throughout the film and lends itself to the Halloween costume of the year. Danny Glover is the sage coworker who introduces Cash to his inner “white voice” that sets him on the prestigious power caller path. Armie Hammer takes on a role that is so morally deplorable that I will need to re-watch Call Me by Your Name to like him again. Sorry to Bother You is going to be a movie that makes people talk. I can’t wait to talk about it more as people see it once it is more widely released. Copyright ©2018 PopEntertainment.com. All rights reserved. Posted: July 13, 2018. Tags: Armie Hammer, Bonnie Paul, Boots Riley, Danny Glover, David Cross, Forest Whitaker, Jermaine Fowler, Kate Berlant, Lakeith Stanfield, Lily James, Lyrics Born, Michael X. Sommers, movie review, Omari Hardwick, Patton Oswalt, PopEntertainment.com, Robert Longstreet, Rosario Dawson, Shelley Mitchell, Sorry to Bother You, Steven Yeun, Terry Crews, Tessa Thompson, The Coup, W. Kamau Bell. Bookmark the permalink. Previous post ← Lana Condor and Noah Centineo Video Interview!